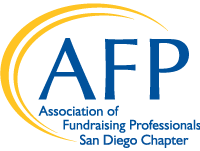 The Association of Fundraising Professionals, San Diego Chapter is pleased to announce the 2019 CFRE Exam/Application Scholarship Program. The AFP San Diego CFRE Exam/Application Scholarship is for $700 to cover cost of the application and exam. Check back in May for additional details on how to apply. Have 7-10 years or more of experience in professional fundraising.